Dermal substitution in acute burns and reconstructive surgery: a 12-year follow-up. Plast Reconstr Surg. 2010 May;125(5):1450-9. doi: 10.1097/PRS.0b013e3181d62b08. Bloemen MC1, van der Wal MB, Verhaegen PD, Nieuwenhuis MK, van Baar ME, van Zuijlen PP, Middelkoop E.
Application of dermal substitutes has been reported to improve the outcome of burns. However, the long-term effectiveness of dermal substitutes has not been investigated objectively. The aim of this study was to evaluate long-term effectiveness of a collagen-elastin dermal substitute in acute and reconstructive burn surgery. From 1996 to 1998, an intraindividual comparison was carried out between a dermal substitute with a split-skin graft and a split-skin graft alone in patients with acute and reconstructive wounds. In this follow-up, scar elasticity, vascularization, pigmentation, and surface roughness were determined objectively. In addition, a subjective scar assessment was performed. In 46 patients, 69 pairs of substituted and conventionally treated sites were measured, consisting of acute and reconstructiveburn scars. In reconstructive scars, one surface roughness parameter was significantly better in substituted scars. Subjective assessment in acute and reconstructive burn scars showed several statistically significant differences in favor of substituted scars, such as pliability, relief, and the general observer score. Elasticity measurements showed higher scores for substituted scars, although the difference was not statistically significant. For the subcategory of scars treated with a largely expanded meshed skin graft, a significantly higher elasticity was found for the substituted area. In this first long-term and objective follow-up of dermal substitution, the authors found improved scar parameters in both acute and reconstructive wounds treated with the substitute, indicating a long-lasting effect on scar quality. Clinical effectiveness of dermal substitution in burns by topical negative pressure: a multicenter randomized controlled trial. Wound Repair Regen. 2012 Nov-Dec;20(6):797-805. doi: 10.1111/j.1524-475X.2012.00845.x. Epub 2012 Oct 30. Bloemen MC1, van der Wal MB, Verhaegen PD, Nieuwenhuis MK, van Baar ME, van Zuijlen PP, Middelkoop E.
Previous research has shown clinical effectiveness of dermal substitution; however, in burn wounds, only limited effect has been shown. A problem in burn wounds is the reduced take of the autograft, when the substitute and graft are applied in one procedure. Recently, application of topical negative pressure (TNP) was shown to improve graft take. The aim of this study was to investigate if application of a dermal substitute in combination with TNP improves scar quality after burns. In a four-armed multicenter randomized controlled trial, a split-skin graft with or without a dermal substitute and with or without TNP was compared in patients with deep dermal or full-thickness burns requiring skin transplantation. Graft take and rate of wound epithelialization were evaluated. Three and 12 months postoperatively, scar parameters were measured. The results of 86 patients showed that graft take and epithelialization did not reveal significant differences. Significantly fewer wounds in the TNP group showed postoperative contamination, compared to other groups. Highest elasticity was measured in scars treated with the substitute and TNP, which was significantly better compared to scars treated with the substitute alone. Concluding, this randomized controlled trial shows the effectiveness of dermal substitution combined with TNP in burns, based on extensive wound and scar measurements. The use of MatriDerm in early excision and simultaneous autologous skin grafting in burns–a pilot study. Burns. 2008 Feb;34(1):93-7. Epub 2007 Jul 17. Ryssel H1, Gazyakan E, Germann G, Ohlbauer M.
The application of dermal substitutes in deep partial and full-thickness burn wounds in a two-stage procedure prior to skin grafting has become increasingly popular. Synchronous application of dermal substitutes and skin graft has not yet been established as a standard procedure. In a consecutive study 20 wounds in 10 patients with severe burns (age 49.5+/-16.2 years; TBSA 45.6+/-14.5%) were treated with either simultaneous transplantation of Matriderm, a bovine based collagen I, III, V and elastin hydrolysate based dermal substitute and split-thickness skin grafting (STSG), or STSG alone after appropriate excision of the burn wound. The study was designed as a prospective intra-individual comparative study. After 1 week all wounds were assessed for the percentage of autograft survival. Autograft survival was not altered by simultaneous application of a dermal matrix (p=0.015). Skin elasticity was measured after 3-4 months with the Vancouver Burn Skin Score (VBSS). The VBSS demonstrated a significant increase of elasticity in the group with dermal substitutes (p=0.04) as compared with non-substituted wounds for sheet autograft, but not for meshed autograft (p=0.24). From this pilot study it can be concluded that simultaneous application of a dermal matrix is safe and feasible, yielding significantly better results with respect to skin elasticity. Skin elasticity was considerably improved by the collagen/elastin dermal substitute Matriderm in combination with sheet autograft. 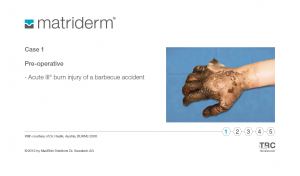 Dermal substitution with Matriderm® in burns on the dorsum of the hand. Burns. 2010 Dec;36(8):1248-53. doi: 10.1016/j.burns.2010.05.003. Epub 2010 Jun 15. Ryssel H1, Germann G, Kloeters O, Gazyakan E, Radu CA. Dermal substitutes are used increasingly in deep partial and full-thickness burn wounds in order to enhance elasticity and pliability. In particular, the dorsum of the hand is an area requiring extraordinary mobility for full range of motion. The aim of this comparative study was to evaluate intra-individual outcomes among patients with full-thickness burns of the dorsum of both hands. One hand was treated with split-thickness skin grafts (STSG) alone, and the other with the dermal substitute Matriderm® and split-thickness skin grafts. In this study 36 burn wounds of the complete dorsum of both hands in 18 patients with severe burns (age 45.1±17.4 years, 43.8±11.8% TBSA) were treated with the simultaneous application of Matriderm®, a bovine based collagen I, III, V and elastin-hydrolysate based dermal substitute, and split-thickness skin grafting (STSG) in the form of sheets on one hand, and STSG in the form of sheets alone on the other hand. The study was designed as a prospective comparative study. Using both objective and subjective assessments, data were collected at one week and 6 months after surgery. The following parameters were included: After one week all wounds were assessed for autograft survival. Skin quality was measured 6 months postoperatively using the Vancouver Burn Skin Score (VBSS). Range of motion was measured by Finger-Tip-Palmar-Crease-Distance (FPD) and Finger-Nail-Table-Distance (FNTD). Autograft survival was not altered by simultaneous application of the dermal matrix (p>0.05). The VBSS demonstrated a significant increase in skin quality in the group with dermal substitutes (p=0.02) compared to the control group with non-substituted wounds. Range of motion was significantly improved in the group treated with the dermal substitute (p=0.04). From our results it can be concluded that simultaneous use of Matriderm(®) and STSG is safe and feasible, leading to significantly better results in respect to skin quality of the dorsum of the hand and range of motion of the fingers. Skin elasticity was significantly improved by the collagen/elastin dermal substitute in combination with sheet-autografts. Preliminary results in single-step wound closure procedure of full-thickness facial burns in children by using the collagen-elastin matrix and review of pediatric facial burns. Burns. 2015 Sep;41(6):1268-74. doi: 10.1016/j.burns.2015.01.007. Epub 2015 Feb 21. Demircan M1, Cicek T2, Yetis MI2. Management of full-thickness facial burns remains one of the greatest challenges. Controversy exists among surgeons regarding the use of early excision for facial burns. Unfortunately, delayed excision of deeper burns often results in more scarring and subsequent reconstruction becomes more difficult. A collagen-elastin matrix is used to improve the quality of the reconstructed skin, to reduce scarring and to prevent wound contraction. It serves as a foundation for split thickness skin graft and enhances short and long-term results. We report the usage of a collagen-elastin matrix during single-step wound closure technique of severe full-thickness facial burns in 15 children with large burned body surface area, and also we review the literature about pediatric facial burns. There were 15 pediatric patients with severe facial burns, 8 girls and 7 boys ranging in age from 10 months to 12 years, mean age 7 years and 6 months old. The facial burn surface area (FBSA) among the patients includes seven patients with 100%, five with 75%, and three with 50%. The average total body surface area (TBSA) for the patients was 72%, ranging between 50 and 90%. 5 of the patients’ admissions were late, more than four days after burns while the rest of the patients were admitted within the first four days (acute admission time). The burns were caused by flame in eight of the patients, bomb blast in four, and scalding in three. All patients were treated by the simultaneous application of the collagen-elastin matrix and an unmeshed split thickness skin graft at Turgut Özal Medical Center, Pediatric Burn Center, Malatya, Turkey. After the treatment only two patients needed a second operation for revision of the grafts. All grafts transplanted to the face survived. The average Vancouver scar scales (VSS) were 2.55±1.42, ranging between one and six, in the first 10 of 15 patients at the end of 6 months postoperatively. VSS measurements of the last 5 patients were not taken since the 6 months postoperative period was not over. In regard to early results, graft quality was close to normal skin in terms of vascularity, elasticity, pliability, texture and color. Esthetic and functional results have been encouraging. This study shows us that the collagen-elastin matrix as a dermal substitute is a useful adjunct, which may result in quick healing with satisfying esthetic and functional results. It also may enhance short and long-term results in after burn facial wound closure in children. Cost study of dermal substitutes and topical negative pressure in the surgical treatment of burns. Burns. 2014 May;40(3):388-96. doi: 10.1016/j.burns.2013.08.025. Epub 2013 Sep 13. Hop MJ1, Bloemen MC2, van Baar ME3, Nieuwenhuis MK4, van Zuijlen PP5, Polinder S6, Middelkoop E7; TOPSKIN Study Group. A recently performed randomised controlled trial investigated the clinical effectiveness of dermal substitutes (DS) and split skin grafts (SSG) in combination with topical negative pressure (TNP) in the surgical treatment of burn wounds. In the current study, medical and non-medical costs were investigated, to comprehensively assess the benefits of this new treatment. The primary outcome was mean total costs of the four treatment strategies: SSG with or without DS, and with or without TNP. Costs were studied from a societal perspective. Findings were evaluated in light of the clinical effects on scar elasticity. Eighty-six patients were included. Twelve months post-operatively, highest elasticity was measured in scars treated with DS and TNP (p=0.027). The initial cost price of treatment with DS and TNP was €2912 compared to treatment with SSG alone €1703 (p<0.001). However, mean total costs per patient did not differ significantly between groups (range €29097-€43774). Costs of the interventional treatment contributed maximal 7% to the total costs and total costs varied widely within and between groups, but were not significantly different. Therefore, in the selection of the most optimal type of surgical intervention, cost considerations should not play an important role. Graft survival and effectiveness of dermal substitution in burns and reconstructive surgery in a one-stage grafting model. Plast Reconstr Surg. 2000 Sep;106(3):615-23. van Zuijlen PP1, van Trier AJ, Vloemans JF, Groenevelt F, Kreis RW, Middelkoop E.
Survival of the autograft and objective parameters for scar elasticity were evaluated after dermal substitution for acute burns and reconstructive surgery. The dermal substitute, which was based on bovine type I collagen and elastin-hydrolysate, was evaluated by intraindividual comparison in a clinical trial. The substitute was applied in a one-step procedure in combination with a split-thickness autograft. This treatment was compared with the conventional treatment, the split-thickness antograft. After 1 week, the percentage of autograft survival was assessed. The Cutometer SEM 474 was used to obtain objective measurements of skin elasticity parameters 3 to 4 months postoperatively. Forty-two pairs of wounds (31 patients, age 32.9 +/- 19.3 years; burned surface area, 19.8 +/- 14.5 percent) were treated because of acute burns. Reconstructive surgery was performed on 44 pairs of wounds (31 patients, age 33.9 +/- 17.5 years). Autograft survival was not altered by the substitute for reconstructive wounds, although a slight but significant reduction (p = 0.015) was established in the burn category for substituted compared with nonsubstituted wounds. However, the necessity for regrafting was not increased by substitution. Cutometer measurements of reconstructive wounds with a dermal substitute demonstrated a significant increase of pliability (50 percent, p < 0.001), elasticity (defined as immediate extension, 33 percent, p = 0.04), maximal extension (33 percent, p = 0.002), and immediate retraction (31 percent, p = 0.01), as compared with nonsubstituted wounds. After burn surgery, no improvement was found for the different elasticity parameters. Dermal substitution in a one-stage grafting model seems feasible with respect to graft survival. Skin elasticity was considerably improved by the collagen/elastin dermal substitute after reconstructive surgery. Reconstruction of full-thickness defects with bovine-derived collagen/elastin matrix: a series of challenging cases and the first reported post-burn facial reconstruction. J Drugs Dermatol. 2012 Jul;11(7):866-8. Haik J1, Weissman O, Hundeshagen G, Farber N, Harats M, Rozenblatt SM, Kamolz LP, Winkler E, Zilinsky I.
Reconstruction of full-thickness defects may benefit from integration of dermal substitutes, which serve as a foundation for split-thickness skin grafts, thus enhancing short and long-term results. We present a series of 7 patients who were treated between 2010 and 2012 for complicated full-thickness defects by the second-generation collagen/elastin matrix Matriderm® covered by a split-thickness skin graft. The defects resulted from malignancy resection, trauma, and post-burn scar reconstruction. Overall graft take was excellent and no complications were noted regarding the dermal substitute. Graft quality was close to normal skin in terms of elasticity, pliability, texture, and color. Good contour and cushioning of defects in weight bearing areas was also achieved. Matriderm was found to be a useful adjunct to full-thickness defect reconstruction, especially in difficult areas where the desired result is a scar of the highest quality possible. First experiences with the collagen-elastin matrix Matriderm as a dermal substitute in severe burn injuries of the hand. Burns. 2007 May;33(3):364-8. Epub 2007 Jan 22. Haslik W1, Kamolz LP, Nathschläger G, Andel H, Meissl G, Frey M.
Restoring function after hand burns plays a major role in the restitution of a quality of life. Thereby the reconstructed pliability of the grafted areas is of utmost importance for good hand function. The collagen elastin matrix Matriderm was evaluated as a dermal substitute for the treatment of severe hand burns. In a series of 10 patients, mean age 43 years, TBSA 22.8%, an early debridement and immediate grafting with the matrix and unmeshed skin graft was carried out in a one-stage procedure. In the early postoperative follow up an overall take rate of 97% was observed. In contrast to conventional skin grafts, the color of the skin grafts over the matrix appeared pale in the first few days, but after 2 weeks no difference was observed. After three months, pliability of the grafted area was excellent, (mean VSS 3.2+/-1.2). Full range of motion was achieved in all hands, no blisters and no unstable or hypertrophic scars occurred. Matriderm has proved to be a dermal substitute suitable for the treatment of hand burns. 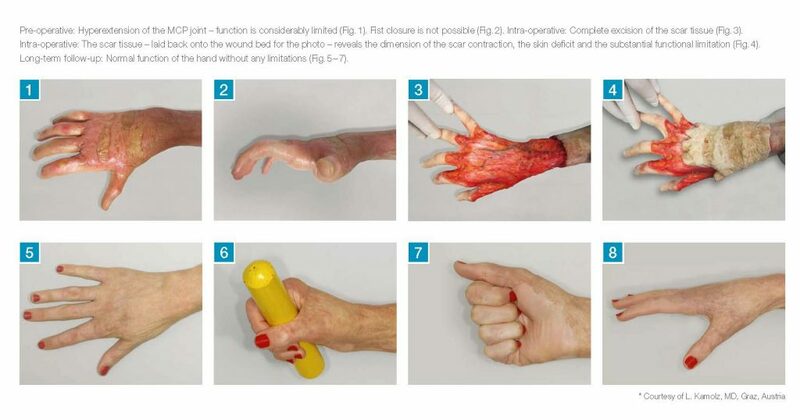 We therefore consider Matriderm as a promising dermal substitute for the treatment of severe hand burns. Management of full-thickness skin defects in the hand and wrist region: first long-term experiences with the dermal matrix Matriderm. J Plast Reconstr Aesthet Surg. 2010 Feb;63(2):360-4. doi: 10.1016/j.bjps.2008.09.026. Epub 2008 Nov 30. Haslik W1, Kamolz LP, Manna F, Hladik M, Rath T, Frey M.
The gold standard for the coverage of full-thickness skin defects is autologous skin grafts. However, poor skin quality and scar contracture are well-known problems in functional, highly strained regions. The use of dermal substitutes is an appropriate way to minimise scar contraction and, thereby, to optimise the quality of the reconstructed skin. The aim of this study was to evaluate the impact of the collagen-elastin matrix, Matriderm, for the single-step reconstruction of joint-associated defects of the upper extremity. Seventeen patients with full-thickness skin defects of the upper extremity were treated with the dermal substitute, Matriderm, and unmeshed skin graft in the functional critical region of the distal upper extremity in a single-step procedure. The take rate of the matrix-and-skin graft was 96%. Long-term follow-up revealed an overall Vancouver scar scale of 1.7. No limitation concerning hand function was observed; DASH-score analysis revealed excellent hand function in patients with burn injury and patients with a defect due to the harvest of a radial forearm flap achieved satisfying hand function. This matrix represents a viable alternative to other types of defect coverage and should therefore be considered in the treatment of skin injuries, especially in very delicate regions such as the joint regions. The possibility of performing a one-stage procedure is supposed to be a major advantage in comparison to a two-stage procedure. Burns. 2014 Dec;40(8):1497-503. doi: 10.1016/j.burns.2014.08.007. Epub 2014 Sep 28. Hur GY1, Seo DK1, Lee JW2. Neck contracture release with matriderm collagen/elastin dermal matrix. To demonstrate success with immediate split-skin graft application over Matriderm dermal matrix in a difficult neck contracture release. 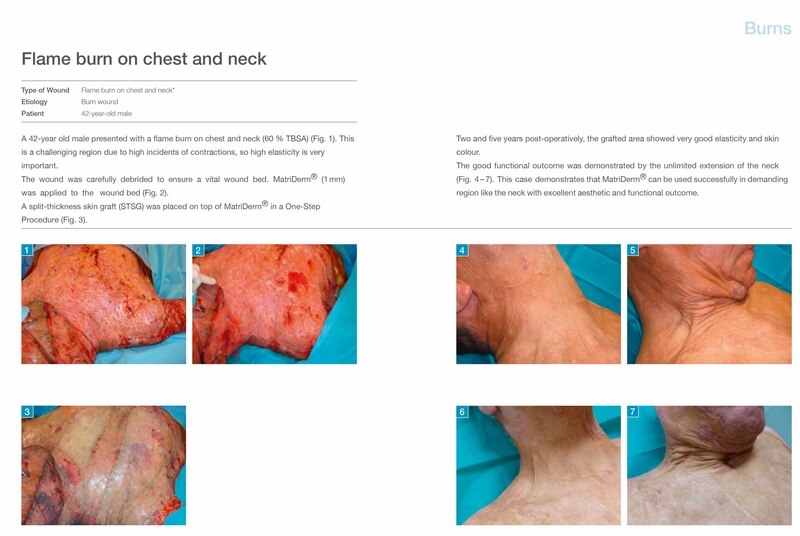 An aggressive neck contracture release, accompanied by complete platysmectomy, was followed by application of Matriderm, split-skin graft, Mepitel, and vacuum-assisted closure (VAC) dressing. At VAC removal (day 7), graft take was almost complete over the dermal matrix and with minor “touch-up” were complete by day 9 postrepair. RESULTS at 4 months show graft contraction and a marked diminution of the release obtained. The results, however, are still good and the patient is very happy. Immediate grafting over a dermal matrix appears to provide a good solution, with a gentle surgical learning curve, in this difficult postburn scenario. Postrelease contraction is, however, as inevitable as with other techniques.